I was born in Manchester in 1945, but grew up in Cirencester, Gloucestershire. I was educated at Cirencester Grammar School, and subsequently followed a career of some 30 years in the Civil Service. In 1996 I accepted the offer of early retirement, and started a new life as a self-employed artist and illustrator. Drawing and painting had always been a natural ability for me, as far back as Primary School days, and this developed over the years with much encouragement and support from family and friends. I am completely self-taught and work mainly in watercolours and gouache, but have also produced numerous pencil, pen & ink drawings, and some oil paintings. My style is representational, and I always aim to produce a colourful and realistic portrayal of any chosen subject. 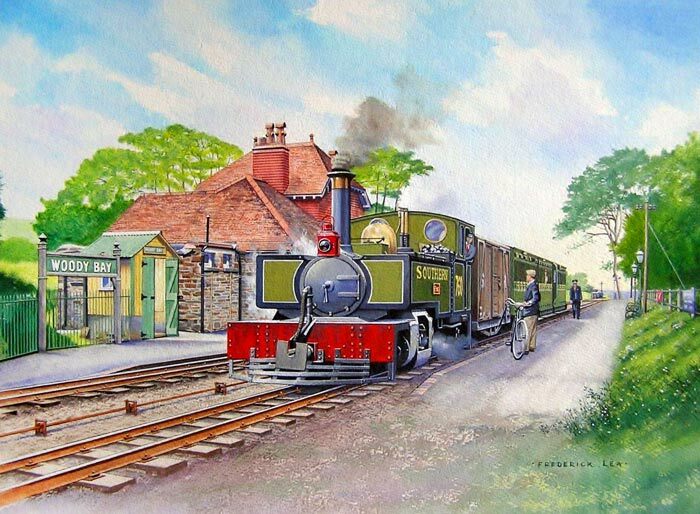 I have always had a passion for railways, and I was accepted as a member of the Guild of Railway Artists in 1996, becoming a Full Member in 1998. 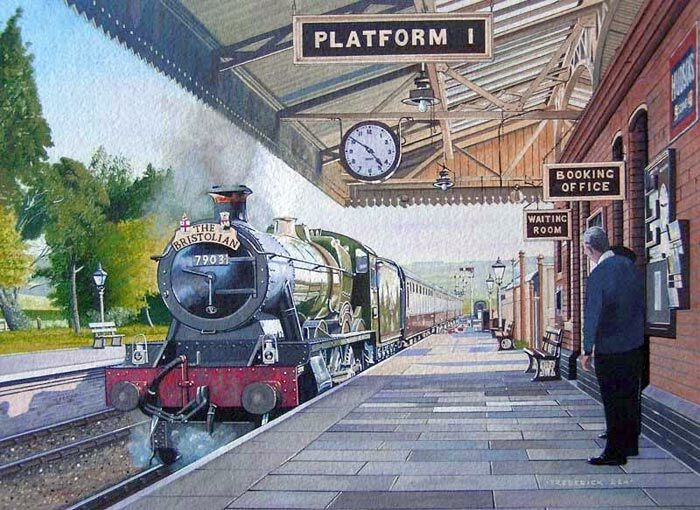 I have exhibited widely in Guild exhibitions since then, including shows at York, Carlisle, Derby and Kidderminster on the Severn Valley Railway. For the past 25 years I have been 'Resident Artist' on the Gloucestershire Warwickshire Railway, my local preserved steam railway in the Cotswolds. 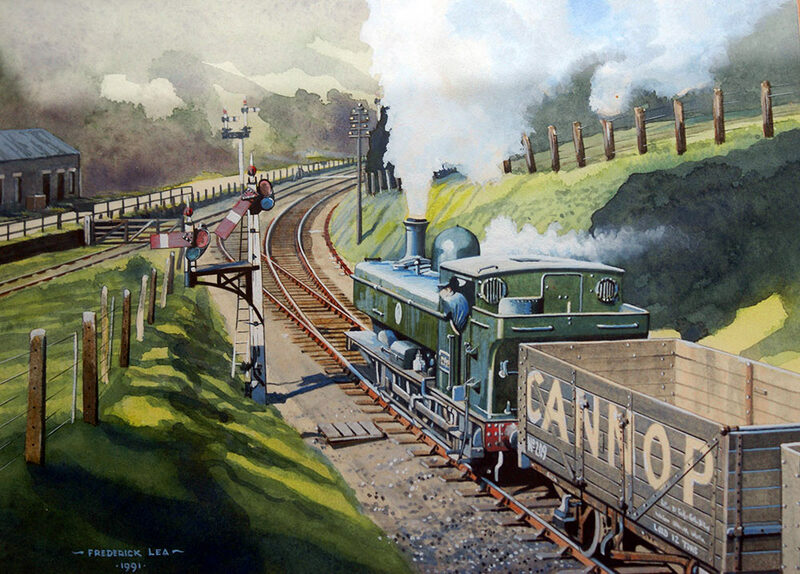 GWR 0-6-0 Pannier Tank approaches Ruspidge Halt on the Forest of Dean Branch. 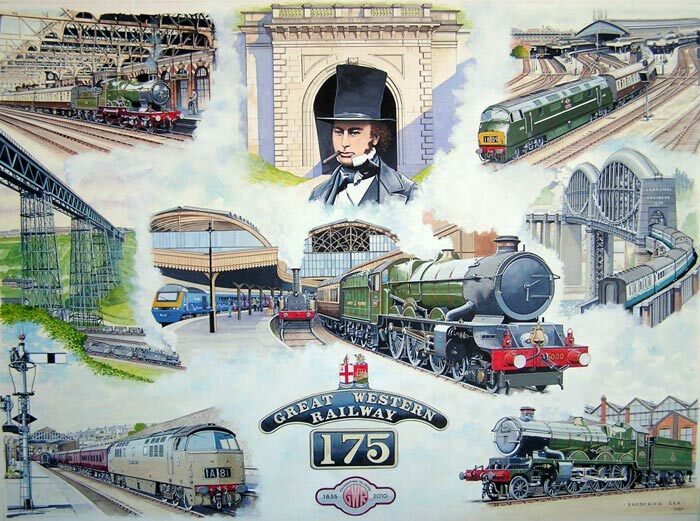 Celebrating 175 years of this iconic railway. Great Western Railway 'King' class loco heads a Paddington - Cardiff - Fishguard Harbour 'Capitals United Express' in 1960. This train ran non-stop to Cardiff. 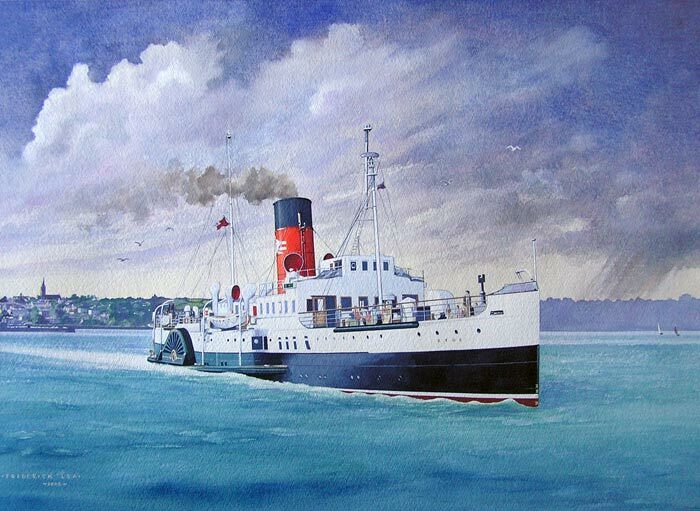 Isle of Wight paddle steamer 'Ryde' leaving Ryde Pier in 1966. 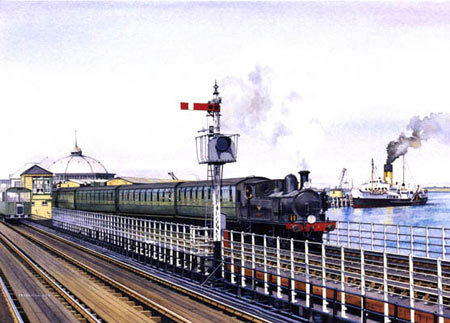 A Ventnor bound train runs across Ryde Pier headed by a 0-4-4 O2 class loco. To the left can be seen a pier tramways petrol driven 2 car set. On the right is the Isle of Wight paddle steamer 'Ryde'. Seaton Junction station in 1961. 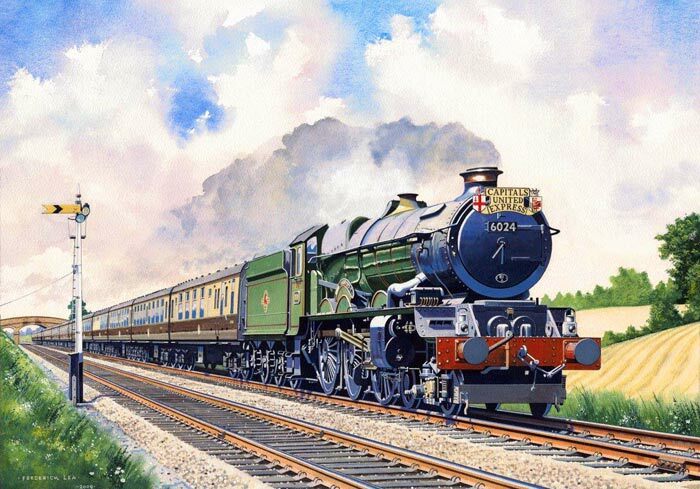 A rebuilt Bulleid 'Merchant Navy' class 4-6-2 hurtles through with the down Atlantic Coast Express. 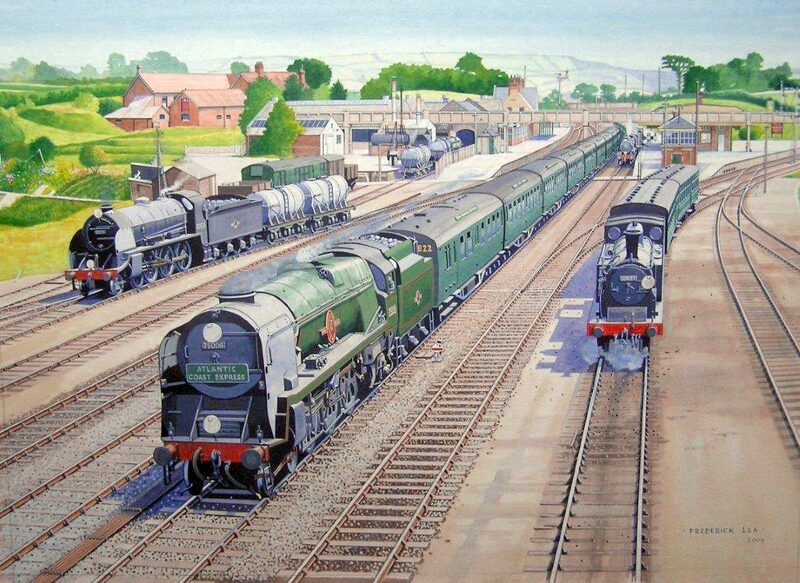 On the left an S15 4-6-0 shunt milk tankers. On the right a Drummond M7 tank engine leaves on the branch line service to Colyford and Seaton. Preserved 4-6-0 Great Western Railway Hall class locomotive no. 7903 'Foremarke Hall' at Toddington station on The Gloucester Warwickshire Railway. War Department 2-8-0 with a coal train c1956. 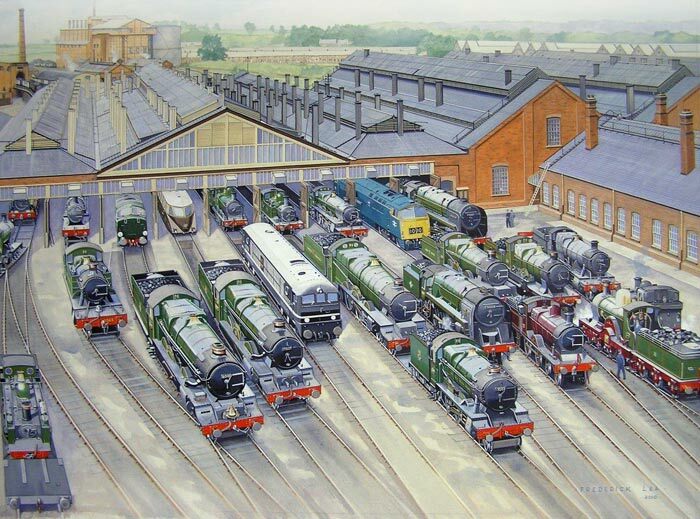 Western Reunion - 100 years of Swindon GWR locomotives. The Lynton & Barnstaple Railway in 1927 - Locomotive No. 760 'Exe' arrives at Woody Bay station.